As a broad generalisation, the 'foundation' principles are ones that were in place prior to the beginning of the 20th century. Men like Copernicus and Newton were the catalysts for great change prior to the 20th century; but these men were very much a product of an earlier worldview; often governed by religious doctrine. As such, they were generally submerged in a worldview dominated by the prevailing religion of the culture in which they lived. For people living in these earlier times, it was natural that the quest for answers, to seemingly unanswerable questions, had ultimately to be deferred to God, irrespective of the theological variance. Of course, this does not mean that people no longer hold to similar views, only that there is now more of an accepted separation between scientific inquiry and faith, in as much that a deity, e.g. God, does not automatically have to be the default answer, when no immediate answer is forth coming. So while the church was an institution of much learning, at the time of Copernicus and Newton, in hindsight it might be seen that the Church also wanted to prejudge the answers to many important questions in the image of their theological beliefs, which in many cases were in direct conflict with empirical observations. In some ways, this was a step backwards, in as much that Greek Science had attempted to rationalise the universe without recourse to the `hand of God' some 2000 years prior to the birth of Newton. Classical or Newtonian mechanics was clearly an advance over the more philosophical nature of Greek science. However, it shared one important aspect with `Aristotle's worldview` in terms of cause and effect. Today, we might describe their philosophical position as being closely associated with the ideas of `reductionism` and `determinism`. Reductionism is the belief that any complex phenomena or object can be explained in terms of simpler phenomena or objects. 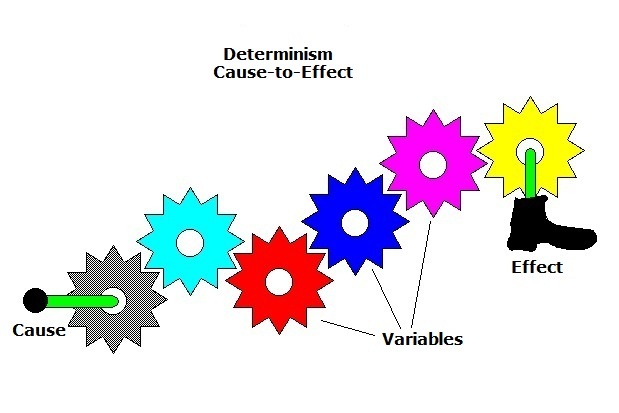 Determinism considers every event, including human cognition and action, as being causally determined by a series of events that leads up to the observed effect. It is a worldview in which the concept of random chaos could not exist and led to the idea of a `clockwork universe`. While it may not have been obvious at the time, this scientific concept was to also have some profound implications on both philosophy and theology. Over time, Newtonian mechanics became the accepted explanation by which any phenomena, of any kind, could be explained in terms of a process proceeding from cause to effect. Some would interpret Newtonian physics by saying God had created the world as a perfect machine that then required no further interference from God, i.e. deism rather than theism. This idea was possibly best articulated by the mathematician Laplace, who suggested that a `Supreme Intelligence` armed with a knowledge of Newtonian laws and a knowledge of the positions and velocities of all the particles in the Universe could deduce the state of the Universe at any time in the future. Of course, such a worldview raises interesting questions about the role of freewill, but this is a discussion for another time. However, Newton's own view was possibly more circumspect than Laplace, as he believed that while the laws of motion and the principle of universal gravitation were suffice to regulate the cosmos, they still required the help of God. Gravity, he hinted, was a divine action, while space was the `sensorium` of God with his `divine abode` being the ultimate coordinate system. But were further seeds of change already being planted within the classical worldview? While the focus of this section will be placed on outlining some of the more the salient points and implications of the classical perspective, two aspects that would undermine the determinism of the clockwork universe will also be reviewed, i.e. the Bohr model of the atom and quantized energy in the form of the photon. Both these concepts are ideas that would emerge at the beginning of the 20th century and lead to another evolutionary paradigm shift in scientific thinking, comparable in scope to that of Copernicus. These ideas would eventually lead to the concept of an expanding universe built on the apparent chaos of quantum probability that would undermine the previous deterministic certainty of a universe, infinite in time and space. However, these are topics for the next section of accepted science and, for now, we shall simply try to review some of the key developments and implications of what might be described as the foundation principles of science. In order to help wider distribution and review, the web based discussion of some of the foundation principles of science has been reproduced in the form of the PDF file above.